The term Vermont Republic has been used by later historians for the government of Vermont that existed from 1777 to 1791. In January 1777, delegates from 28 towns met and declared independence from jurisdictions and land claims of both the British colony of Quebec and the American states of New Hampshire and New York. They also abolished adult slavery within their boundaries. Many people in Vermont took part in the American Revolution although the Continental Congress did not recognize the jurisdiction. Because of vehement objections from New York, which had conflicting property claims, the Continental Congress declined to recognize Vermont, then called the New Hampshire Grants. 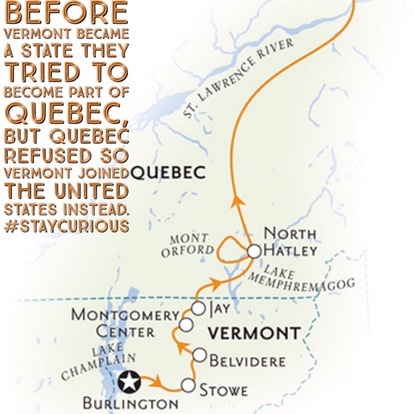 Vermont's overtures to join the British Province of Quebec failed. In 1791, Vermont officially joined the United States as the 14th state.Vermont coined a currency called Vermont coppers from a mint operated by Reuben Harmon in East Rupert (1785–1788), and operated a postal system. While the Vermont coppers bore the legend Vermontis. Res. Publica (Latin for republic or state), the constitution and other official documents used the term "State of Vermont". It referred to its chief executive as a "governor". The 1777 constitution refers to Vermont both as "the State of Vermont", as in the third paragraph of the preamble, and in the preamble's last paragraph, the constitution refers to itself as "the Constitution of the Commonwealth". The Vermont Republic was called the "reluctant republic" because many early citizens favored political union with the United States rather than independence. Both popular opinion and the legal construction of the government made clear that the independent State of Vermont would eventually join the original 13 states. While the Continental Congress did not allow a seat for Vermont, William Samuel Johnson, representing Connecticut, was engaged by Vermont to promote its interests. In 1785, Johnson was granted title to the former King's College Tract by the Vermont General Assembly as a form of compensation for representing Vermont. The members of the Convention of 1787 assumed that Vermont was not yet separate from New York; however, Madison's notes on the Federal Convention of 1787 make clear that there was an agreement by New York to allow for the admission of Vermont to the union; it was just a question of process, which was delayed by larger federal questions. A man's bid to become a police officer was rejected after he scored too high on an intelligence test.